I hadn’t really planned on the Foundations Revealed corset competition entering this year. I spent a little too much money and time last year… I didn’t think of it again until mid year when I came across a little sketch on a scrap of paper. 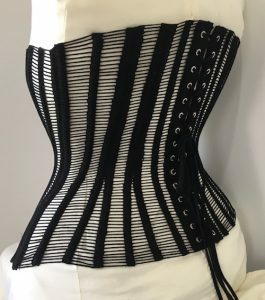 The idea was a corset made of crochet. It was only a seed of an idea, unlikely to be simple and less likely to work. It did seem like it could easily fit into the Architecture theme so perhaps I could give it a go and see how it ended up. The completion offered a nice excuse and I decided to challenge myself in that however it turned out I would submit it. I have always worked in crochet and have a lot of history making complex shapes I understand a fair bit about its capabilities. The chain stitches are actually quite rigid but the double crochet stitch making the channels has a bit of stretch. 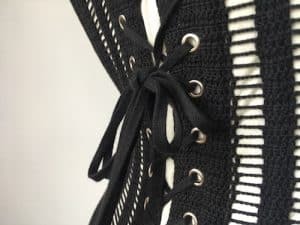 If the stretchy part of the crochet was put under tension by the boning then the resulting corset should be able to give a good shape. The pattern was one taken from an image in the Symington collection, 1890s ish. Drafted up to my measurements and then made into a toile of cheap canvas and zip ties. The second test was in Bobbinet, another material I hadn’t used before and wanted to test out. I made a few more adjustments to the pattern after making this version. Once the pattern was ready I could proceed with the crochet. I did some test swatches and decided on my thread and hook. This gave me a stitch gauge which I used to make custom graph paper exactly to scale, printed from excel. 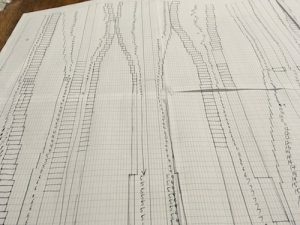 I then transferred the pattern pieces onto the graph paper. With a pen and a lot of time I drew each boning channel onto the paper, 5 stitches down the length of the piece where I wanted the channels to be. 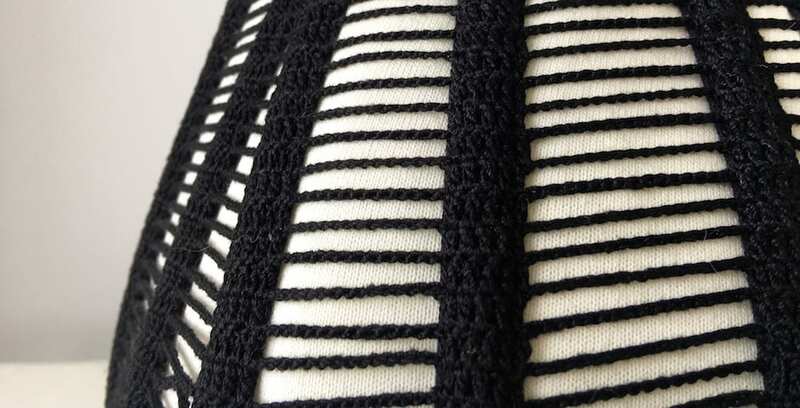 The number of stitches between these channels was the count of the chain stitches needed between. Once this was done I realised I didn’t need cumbersome paper to work off, I made another spreadsheet and simply noted the counts. I could then print off 2 copies and cross off the stitches as I did them. 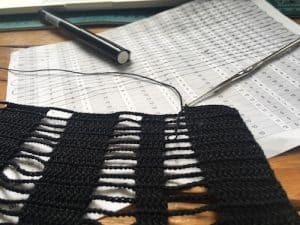 I had toyed with the idea of it would be possible to work the channels in crochet but on my test swatch the coutil channels sewn on looked great and held the crochet rigid. How to get the ends closed was a problem I would wait until the crochet was done to solve. I ended up applying the channels up one side and folded under across the top and down the other side. Leaving the bottom edge open to place the bones and close with my edge stitching foot. The texture of the crochet hid all the detail of the stitching so I could stop and start like that without any change to the outside. The busk is hidden in coutil and sewn on. The eyelets were left as small holes in the crochet but I still backed them with coutil to hold the bones and prevent too much pressure on the crochet alone. 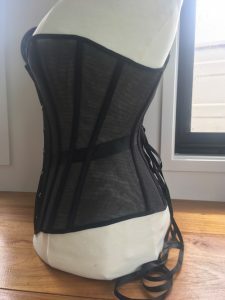 When all was done and I finally had a chance to get the corset on a dress form I realised that the technique worked brilliantly but I had some serious fit issues with the pattern. 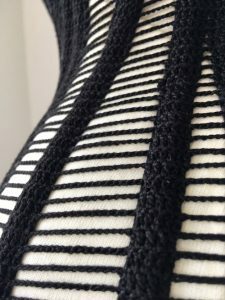 The bottom edge is too wide so the lines of the stitching are not nice and parallel like the lines around the waist and bust. Another toile in fabric would have been a good idea to ensure I had made enough reduction around the front bottom edge. I do wonder however if this was in fabric would the same issue be quite so obvious? The fit problems were worse when I tried it on myself. It was overall too large and even wider around the bottom edge. 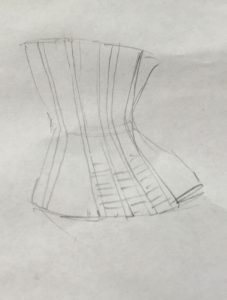 My plan to submit whatever the outcome was tempered a little with vanity as I have decided to use the dress form photos for my submission. I will include some of the photos on me below as following links is mostly for friends and fellow makers not the general public. When I have some time I will try again. A shorter busk and revised bottom edge along with some changed to the top edge. I like the mid bust fit through the front but perhaps don’t need to raise the back as much. This entry was posted in Blog, bridal original, construction, Corsetry, crochet. Bookmark the permalink.